Guess which link I clicked on first. “[She] finishes presentation a goddamn hero” … right? My first thought was… that’s something I’d like to see. But the woman was absolutely right, brave and funny. And just 18. “absolutely right, brave and funny” Huh. If she had come into one of my classes inappropriately dressed, and responded to a request by the professor in an insolent manner, I would have had her out of the class immediately and permanently. Let her take her attitude elsewhere, I don’t need people acting up in my classes. Attitudes include both the puerile and the prudish on an 18yo’s choice of shorts. Pedagogical priorities. What other possible explanation could there be… Russian collusion? Geothermal heat flux? No way… ‘gotta be human-caused. What’s more amazing is global warming alarmists have no problem imagining the LIA and MWP never happened and that CO2 has magical properties not observed in nature. Conflict and poor governance were probably the primary factors in climate change in Africa. That’s likely what is causing desertification there rather than greening. The arguments (conflict and climate) were the subject of a strong editorial in nature . Thanks. I saw that earlier but didn’t read it. They totally neglect what I think is obvious, that studies probably also get cause and effect mixed up. Poor policy and conflict probably lead to ecological degradation and regional climate change. It probably feeds back into conflict, exacerbating the situation and vice versa. I suspect that climate change has actually made the good times better in the Syria region and probably made that drought less severe than it otherwise would have been. CO2 fertilization and improved water efficiency were probably even greater factors. Worse, climate change becomes an excuse. I think the biggest risk from climate change isn’t what will happen to extreme weather and sea level rise, but that the benefits will cause society to grow in ways that make it vulnerable. The benefits will lead to population growth and development of fragile infrastructure that is unprepared for normal extreme events. I believe desertification is a fallacy. Deserts occur because of the lack of precipitation. Most precipitation events are not dependent on existing soil but on dynamic events within the general circulation, commencing well removed from the extent of the desert. While humans can certainly degrade the soil, if it rains, there will be more vegetation and of the type that uses greater amounts of water. If rain becomes less frequent or less copious, there will be less vegetation and of the desert types which store and preserve water. A slight meandering of the ITCZ northward, and the Sahara greens. This appears to be what happened during the Holocene Climatic Optimum. During the HCO, Arctic summers received much more solar radiance, making Southern air relatively denser and pushing the ITCZ Northward. Thus, Saharan grasslands prevailed. In present day, Arctic summers are relatively colder, and the Northern Hemisphere pushes the ITCZ back closer to the equator, but with it, the rains, making the Sahara again extreme desert. Humans didn’t have anything to do with this. 4. Macquarie University sacked Professor of Climate Risk, Murry Salby for his contrarian views. Just a few examples of what academia has become. They are so sure of climate change (and so sure of the virtue of believing in it) that someone like Bob Carter (who I knew) is viewed as if a flat-earther. You wouldn’t have someone on the faculty who believes the earth is flat, would you? Or the moon made of cheese? Latest in a Peter Ditlevsen’s series of articles since 2005, where he attempts to show Dansgaard-Oechsger events are random, not periodical. He has always failed to see that the interaction of a cyclical forcing with the chaotic, changing, climate system should produce exactly the result we observe. A quasi-periodic phenomenon that fails stringent tests of cyclicity devised for regular period cycles. The 180° phase-shift displayed by numerous proxies showing the 1500-year cycle at the glacial-interglacial boundary is strong evidence that Ditlevsen is wrong. D-O events and the Holocene 1500-year cycle are climatic manifestations of a cyclical forcing. O/T but I’d be interested in your comment on the relevance of this with respect to the 1500 year cycle. Figure 15:21 in Coxon and McCarron shows rapid warmings occurred at 14,500 and 11,500 years BP in Ireland, Iceland and Greenland (i.e. 3000 years apart). The warmings were from near glacial to near current conditions and took just 7 years and 9 years respectively. And guess what? life thrived during these rapid warmings. Even though these warmings took place at colder temperatures than now, it suggests that warming towards Earth’s more normal temperature (average of 7 C warmer than now over the past 540 Ma) is likely to be beneficial for ecosystems, not detrimental. Figure 15.21 The stable isotope record (∂18O) from the GRIP ice core (histogram) compared to the record of N.pachyderma a planktonic foraminiferan whose presence indicates cold sea temperatures) from ocean sediments (dotted line). High concentrations of IRD from the Troll 8903 core are marked with arrows. After Haflidason et al. (1995). The transition times for critical lengths of the core were calculated from the sediment accumulation rates by the authors and these gave the following results: Transition A: 9 years; Transition B: 25 years; and Transition C: 7 years. Such rapid transitions have been corroborated from the recent NGRIP ice core data. He has always failed to see that the interaction of a cyclical forcing with the chaotic, changing, climate system should produce exactly the result we observe. Yes – a periodically forced nonlinear oscillation. A litany I have been reciting for years. Dynamical chaotic systems are hard to understand if you have no background. You and Javier are correct. That’s very interesting. Since the mid 1990’s there has been a fast AMO warming, negative changes in cloud cover, positive changes in water vapour, all in the same time frame as the decline in solar wind pressure and temperature. Looks like multiple negative feedbacks to solar variability to me. 2015,2016, and 2017 all experienced the lowest albedo of the brief record. Hard to tell, but it could be the effect of reduced NH snow cover in those warm years that reduced the albedo. This would be a positive feedback effect to the warming rather than a cause. There could also be some positive cloud feedback, as might be expected in the tropics, but that is even harder to tell without more detailed latitude data. Well, there’s certainly a lot of room for bias and error in the CERES data, given the geometry of reflection. However, we can rule out NH snow cover, because the effect is not limited to the winter months of snow cover ( and clouds are a larger determinant of global albedo than surface effects ). And interestingly, this variance is MUCH larger than predictive models indicate. 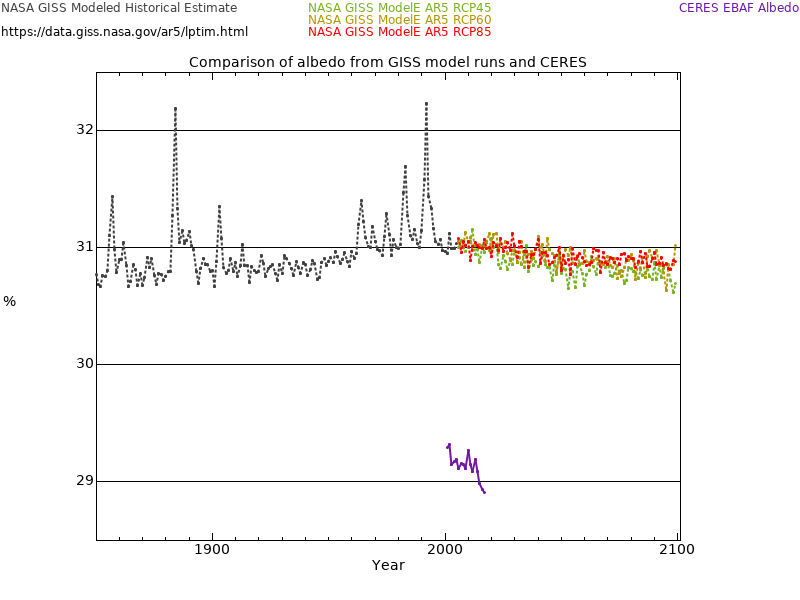 In fact, comparing CERES albedo (computed as outgoing global shortwave a percentage of incoming global shortwave), with modeled albedo, one observes that mean CERES albedo is 29.1% while the NASA GISS Model E has an albedo of 31%. This represents about the same forcing difference as A QUADRUPLING of CO2. If the CERES data is correct, there’s no way the models could make any useful prediction because the energy flows would necessarily be in error by more than the signal. The largest effect does appear to be at the NH winter peak, but that is where it is hard to tell from the graph. Nor would this be surprising in warm years. A large effect may also be expected in spring due to earlier melting. The NH northern continents are the fastest warming land areas globally, and the reduced length of the snow-covered season is a big factor in that. After Arctic sea ice, seasonal snow cover is one of the biggest surface albedo feedbacks to look for in a warming climate, and I think that graph indicates it is a bigger feedback effect now than it used to be. 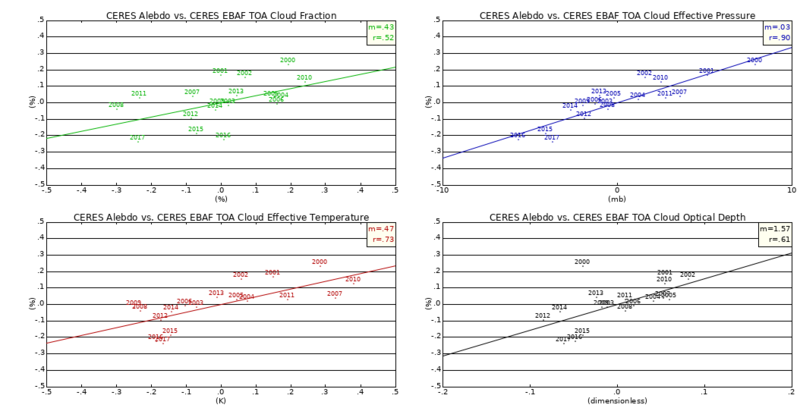 The CERES data includes some cloud parameter estimates. Albedo is most closely correlated with “Cloud Effective Pressure” reflecting a composite of cloud height. Albedo is least correlated with “Cloud Fraction”. It is mostly cloud – mostly tropical and subtropical and largely Pacific. Rapid changes and typical low cloud spectral signature. More (less) cloud cover decreases (increases) IR emissions and increases (decreases) SW reflection. Dominated globally (Clements et al 2009) by more open (closed) cell cloud over a warmer (cooler) surface in the eastern Pacific. 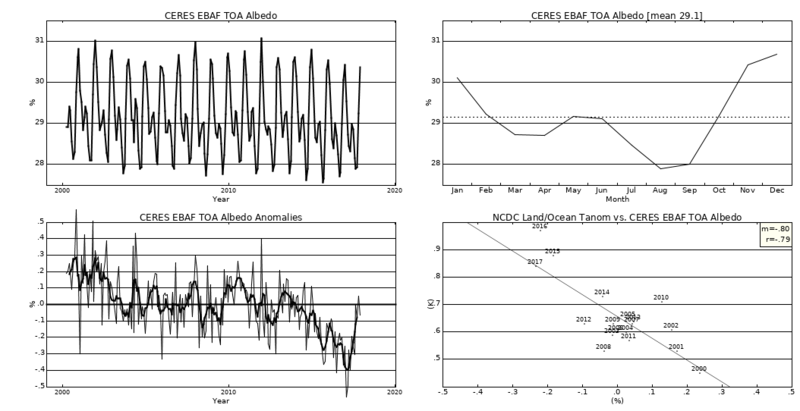 Recent years seeing warmer conditions of course – with the CRE observable in CERES data. The largest temperature anomalies are for NH land in the winter. This is more likely from surface snow cover differences between years. It is hard to think of a mechanism by which clouds could account for that over the land, and no one is trying to propose that explanation for it because snow is persistent while clouds are not. stop the presses – largest warm anomaly in NH. It is more likely heat and moisture transported north from warmer climes with ice and snow responses. Ice nucleating particles (INPs) – are the cold climate equivalent of rain drop nucleation with aerosols. The former reminding me of the webbly Bose-Einstein condensate meltdown – gasp – and the latter important in the nonlinear cloud and rain equation. A warmer surface, more active biology and more releases of a chemical gloop – from both oceans and land – that become organic water droplet and snow flake nucleation sites. Modeled either as a bi-stable nonlinear equation with an aerosols delay factor – or as rates of ice nucleation of Bose-Einstein condensate statistics? Since the atmosphere responds to surface heating, anomalous warmth in the upper ocean layers gradually heats the atmosphere, mainly through increased precipitation heating in response to large rates of evaporation from the warm surface waters. Have we also considered that CO2 concentrations are a lot higher in the NH, over land, during winter than the more well mixed levels measured in Hawaii? There is no reason to believe that the natural annual variation is increasing, so it does not explain why the NH land is warming faster than other regions. The most likely cause is the albedo feedback from reduced snow cover, and some effect of the nearby Arctic Ocean warming fast due to the sea-ice loss. No reason? I’m quite certain you’re wrong about that. CO2 uptake in increasing in summer. That mean when it stops in fall, our growing emissions aren’t absorbed so much. There is also more deceased plant to decompose in fall winter and spring. Take a look a just Hawaii, well mixed, data. The variance is indeed increasing. I am quite certain you are substantially wrong. Albedo change is a factor, but only a small part is likely feed back, and it only affects northern latitudes at a time when angle of incidence is high and days are still short. Changes in precipitation and melt, latent-sensible heat transfers, are most likely causes unusually anomalies. Natural variation in albedo next. Then a small affect in snow and ice response to GHE and higher GHG concentration in winter. The annual variance is not increasing, but what is increasing is the temperature, and that is causing the albedo to decrease which further increases the winter temperature. It’s a classic positive albedo feedback due to diminishing snow cover in warming conditions. The variance is increasing. Stop pretending you know what you’re talking about. It has been a 5-6 ppm annual cycle since the record began. Meanwhile the absolute value has risen by 100 ppm, a much larger effect. Seasonal variations of atmospheric carbon dioxide (CO2) in the Northern Hemisphere have increased since the 1950s, but sparse observations have prevented a clear assessment of the patterns of long-term change and the underlying mechanisms. We compare recent aircraft-based observations of CO2 above the North Pacific and Arctic Oceans to earlier data from 1958 to 1961 and find that the seasonal amplitude at altitudes of 3 to 6 km increased by 50% for 45° to 90°N but by less than 25% for 10° to 45°N. An approximately 50% increase in seasonal exchange of CO2 by northern extratropical land ecosystems, focused on boreal forests, is implicated, substantially more than simulated by current land ecosystem models. The observations appear to signal large ecological changes in northern forests and a major shift in the global carbon cycle. Records of the annual variation of the atmospheric carbon dioxide concentration at Mauna Loa, Point Barrow, and Weathership P are examined for secular changes. The amplitude of the annual variation appears to have increased in recent years with a best estimate of the rate of change, based on the Mauna Loa data, of 0.45±0.42% yr−1. This change is discussed in terms of changes in biospheric respiration and photosynthesis and the use of fossil fuels. The analysis does not allow for the separation of several possible causes of amplitude change. However, if the change is interpreted as reflecting enhanced biospheric growth, the effect is equivalent to a 8% change in the net summer uptake of carbon over the years 1959–1978 and to a growth of the northern hemisphere seasonal biosphere of 0.5×1012 kg of carbon per year. Such a conclusion is consistent with recent inventory studies, which indicate that temperate zone forests have acted as a net sink of about 1012 kg of carbon per year in recent decades. Detailed measurements of this phenomenon at Mauna Loa, Hawaii have revealed that the biosphere’s seasonal CO2 “inhalations” and “exhalations” are growing more and more pronounced each year, as the average CO2 content of the atmosphere rises with time. The increasing vigor of this phenomenon is revealed in the accompanying figure, where the yearly differences between the high and low points of the seasonal CO2 cycle are plotted as a function of time. As can be seen from these data, over the period 1958-1999 the “breath” of the biosphere has been considerably enhanced. The 19.5% increase in the strength of this phenomenon is primarily a direct result of atmospheric CO2 fertilization (Pearman and Hyson, 1981; Cleveland et al., 1983; Bacastow et al., 1985; Enting, 1987; Kohlmaier et al., 1989; Keeling et al., 1996), nitrogen-induced increases in the growth rates of earth’s ecosystems (Shindler and Bayley, 1993; Hudson et al., 1994; Galloway et al., 1995), and CO2-induced expansions in some of their ranges (Idso, 1995). A slight temperature increase reported in some Northern Hemisphere land areas over this time period may also be a contributing factor (Keeling et al., 1996; Myneni et al., 1997). Together, these phenomena combine to produce the results shown in the graph above, which stands as a strong testament to the reality of the ubiquitous “greening of the earth” (Idso, 1986) that is currently in progress. “In September, CO2 levels drop to a minimum because the vegetation in the northern hemisphere has been taking up carbon dioxide from the air during the whole summer”, explains Matthias Forkel. He recently moved from the Max Planck Institute in Jena to TU Wien in Austria. He and Nuno Carvalhais from the Max Planck Institute of Biogeochemistry are the first authors of the study. In the early 1960s, the seasonal carbon dioxide amplitude in Hawaii amounted to 6 ppm. In the meantime, it has risen to approx. 7 ppm. The increase in northern regions has been even greater. For instance, in Barrow, Alaska, the annual CO2 values in the beginning of the 1960s varied by 15 ppm. This variation has now increased to 18 ppm, which corresponds to an increase of nearly 25 per cent. Using aircraft measurements, a team working with British scientist Heather Graven in 2013 proved that these changes in the northern latitudes are wide-ranging, even at altitudes of around 6 kilometres. 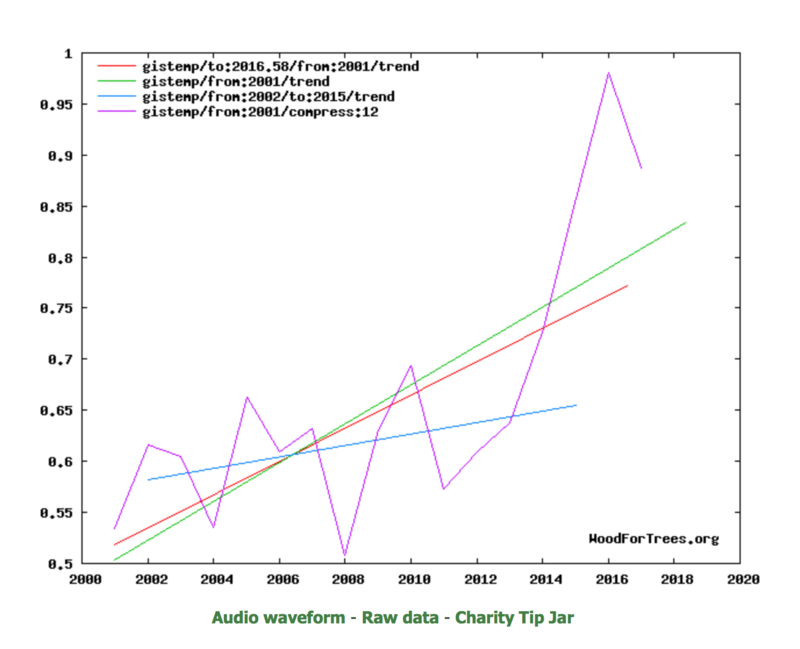 Graven and her colleagues did not provide an explanation for the trend in the article they published in Science back then, as the increase did not show up in climate models. According to Markus Reichstein, Director at the Max Planck Institute of Biogeochemistry in Jena and co-author of the new study, there were several hypotheses on why the amplitude increases. At that time, many scientists already suspected that the phenomenon was related to observed increased greening in the Arctic. Some blamed the intensified agriculture and its higher yields; others thought that the CO2 fertilisation effect might be the cause. Ecosystem carbon (C) uptake in terrestrial ecosystems has increased over the past five decades, but with large interannual variability (IAV). However, we are not clear on the attribution and the processes that control the long-term trend and IAV of land C uptake. Using atmospheric inversion net ecosystem exchange (NEE) data, we quantified the trend and IAV of NEE across the globe, the Northern Hemisphere (NH), and the Southern Hemisphere (SH), and decomposed NEE into carbon uptake amplitude and duration during each year from 1979–2013. We found the NH rather than the SH determined the IAV, while both hemispheres contributed equivalently to the global NEE trend. Different ecosystems in the NH and SH had differential relative contributions to their trend and IAV. The long-term trends of increased C uptake across the globe and the SH were attributed to both extended duration and increasing amplitude of C uptake. The shortened duration of uptake in the NH partly offsets the effects of increased NEE amplitude, making the net C uptake trend the same as that of the SH. The change in NEE IAV was also linked to changes in the amplitude and duration of uptake, but they worked in different ways in the NH, SH and globe. The fundamental attributions of amplitude and duration of C uptake revealed in this study are helpful to better understand the mechanisms underlying the trend and IAV of land C uptake. Our findings also suggest the critical roles of grassland and croplands in the NH in contributing to the trend and IAV of land C uptake. “Plants are accumulating carbon in the spring and summer when they’re active, and they’re releasing carbon back to the air in the fall and winter,” Graven explains. And that up-and-down pattern contains important clues about the plants that grab that carbon dioxide and use it to grow. Scientists at Scripps and elsewhere are publishing a new study that looks at that global breathing pattern in detail. The new data include air samples taken from an airplane that flew repeatedly over the Pacific Ocean, from one pole to the other, to look for small differences in carbon dioxide. The group reports in Science magazine that the teeth in that saw-tooth pattern have grown bigger over the past 50 years. “The vegetation is taking deeper breaths, if you will,” Graven says. In particular, that is happening in the far northern parts of the planet, mostly the boreal forest and the Arctic tundra. And Graven says you can actually see changes in the vegetation from space and in aerial photographs. https://journals.ametsoc.org/doi/full/10.1175/JCLI-D-12-00589.1 In the RCP8.5 simulation, where CO2 increased to 1150 ppm by 2100, the CESM predicted increases in interannual variability in the Northern Hemisphere midlatitudes of up to 60% relative to present variability for time series filtered with a 2–10-yr bandpass. Such an increase in variability may impact detection of changing surface fluxes from atmospheric observations. It may have increased by 1 ppm from 5 ppm in amplitude to 6 ppm, but the mean has changed by 100 ppm over the same period. This is the larger effect, however you cut it. Mauna Loa is not the land surface near temperate forests and anthro-carbon sources. A 1ppm change over 6 is quite a lot. It has likely changed a lot more over land, closer to the surface. There are likely valuable insights to be gained. OCO2 is a start, more should be done. This is probably related to sea ice. For NH land the maximum is in the winter, probably related to loss of snow cover compared to the mean. fonzie, the original subject was the large recent albedo change, so I thought you were still talking about those years which had large winter warm perturbations over the NH land. But maybe you changed the subject, and that’s fine to do too. Continue. Don’t let me interrupt. Thickening of sea ice (increasing multi-year ice) could mean less melt in summer and less sensible heat converted to latent. Lower extent, but more mass concentrated in one area. afonzarelli: This behaviour is inherent in the sst warming. When you compare the trendslopes of the single months with the average monthly temperatures 1982…2017 you’ll find a close relationship: as warmer it gets as stronger increase the slopes. This is to observe also for the latidudes 20…30N where there is no snowfeedback but only for SST, not for land temps. Also not in the tropics. In the SH this coherency is much weaker, not as significant as in the NXT where it’s very significantly. I could not find a solution up to now but I estimate some positive feedback for the SST. .
James Cook U was already on my s-list because of their shameful treatment of Mathew Vickers, a young researcher who was bitten by a shark and suffered serious injuries. JCU has rather sleazily done everything it can to avoid helping young Mat with this medical bills. Bottom line is – no one should work for JCU in any capacity; It’s more interested in CYA than in its students, volunteers or employees. All interconnected with coupled regime changes involving variability in the polar annular modes. 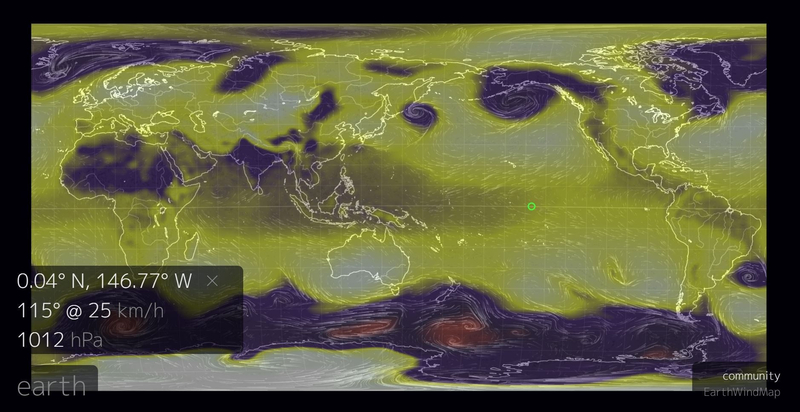 The earth.nullschool near real time super computer visualization of winds and mean sea level pressure below are best viewed dynamically. Darker colors are lower pressure and brighter higher. Turbulent winds and currents are spinning off the the Southern Ocean until they hit Drakes Passage. Depending on the state of the Antarctic Oscillation (AAO) – still moderately negative – pushes winds and currents into lower latitudes spinning up ocean gyres, at the equator pushing warm surface water west with more deep ocean upwelling in the eastern tropical and subtropical Pacific especially. Triggered at least in part by solar UV/ozone chemistry. I like to follow where heat and moisture in the atmosphere is. A lot of it in the Indo-Pacific region – some into a low pressure cell north-east of japan, some into the Aleutian Low… the tropical convergence zone moving north with the Sun. The Pacific remains in a vaguely negative MEI state – but the odds are that ENSO will do something or other soon rather than meander about being vaguely neutral. GISS down only 0.02. still any little bit helps. enso 0.13 positive. Lucky there is a lag so expect more cooling for 3 months then ?? It’s really weird that there is a lag in GISS. Changes should happen at the surface before the broader troposphere. The lag already happened. July is often a low anomaly. That won’t, if it happens, be a lag, just normal. Technically speaking you should not have an often low anomaly, after a while it should become normal, not an anomaly. Did not expect to to ever drop to .46C overnight JCH but at some stage/years if AGW has flaws the downtrend should kick in. Still more life in the old gal yet. Is that half a palindrome? The 21st-century trend, pause and all, is skyrocketing toward .2 ℃ per decade over the 1st two decades of the 21st century. Before the back-to-back La Niña events the 21st-century trend was .0163 ℃ per year. After the two La Niña events are factored in, the 21st-century trend is .019 ℃ per year. I din’t think you realize how much cooling would be required the derail the IPCC bullseye. if temps fell at the end should not the trend be lower? Piomas is helping out now, famous last words. If it is cold at the extreme and neutralish in the middle temps should keep falling for a while. If the anomalies are above the longterm trend, then the trend will continue increasing. .86 ℃ is a 30-year and 21st-century trend booster. The double La Niña average was obviously a big trend booster. The numbers you need are low: ~.. You need a bunch of them before 2020. GISS down only 0.02. still any little bit helps. No! Every little bit of warming helps, not cooling. Cooling is detrimental not beneficial. Warming is beneficial. This certainly does not look like it’s moving to a negative phase. And with increased El Nino episodes due to the solar minimum, warm AMO pulses will also increase. While the overturning rate has slowed, the Gulf Stream has not slowed, so that should result in increased heat transport to the far North Atlantic and Arctic. So alarmists are like President Trump in that they blame the media. If you see something, say something, as if the terrorists are planting bombs. Don’t talk to skeptics. The media gives equal time to skeptics. That’s bad and unfair. How many ways can the media work into a story, Global Warming? There was the scientist that after a hurricane or maybe it was a whatever is one less than a hurricane, that it was made about 6% worse because of global warming. The authors suggest: ‘…overstatements of scientific findings in public.’ I am a CPA. An overstatement of accounting findings in public (ExxonMobil’s balance sheet is this.) can result in a lawsuit against the CPA and discipline from their governing board. How lackadaisical can you be as a member of your profession? More than you want to know. CPAs were the Catholic Church. We did tax returns. Then enter the interwebs. Take a picture of your W-2. Click here. And here. Spend another 10 minutes with this. Then you’re done. So my marketing approach is, You are an idiot. Just kidding. However I deal with this I hope to do better than the climate scientists. Accepting change and playing to my strengths. Maybe I’ll get a life coach? I am a teacher. I often end up explaining things more than people want to know. It is true I deal with something simpler. Our tax code which once you throw out the subjectivity, is a glorified spreadsheet. Communication is teaching. It is those profs you liked in college. Those classes you looked forward to going to. A thought. They want to mitigate change. We want to adapt to it. Judith, congratulations on the Tucker Carlson interview. Getting the word out to many beyond the denizens here. More good news. We’ve altered Earth’s water resources to make it rain more in Minnesota. I was worried the Gulf would shut off our rain because of global warming. Rain equals money, we don’t need saving. But we do need more rail lines to ship all the corn we are growing. So just make the checks out to: WeNeedaChoCho. That map looks good. Who needs all that ice anyways? Let’s dump that water on farm fields instead. Yes, I am sorry for the drying out deal for some people. But how many winters have I had to endure living in Minnesota? We’ve had tornadoes, hail, pestilence and fires. Okay those fires were a long time ago. And then there’s road repairs and mosquitoes. More good news. 5/21/2018 – Minnesota lawmakers have moved to stall implementation of the state’s proposed rule for reducing nitrate levels in groundwater supplies in farm country. In other news… Report: Toxic algae are growing threat to water, human health. The name Minnesota is of Dakota Sioux origin, meaning “cloudy water”. Zebra mussels will fix that for you. * Note toxic algae is cyanobacteria, not phytoplankton. I was looking into natural nitrogen fixing a little last week and saw an interesting paper. Apparently use of synthetic nitrogen is inhibiting the growth of nitrogen fixing fungus. I guess if plants (primarily trees) have ample supply of nitrogen, they don’t need and don’t feed the fungus. IIRC. Excess nitrogen applications are being worked on. If you Google crop rotations, they often refer to a nitrogen you don’t have to buy savings. I need to study cover crops for Minnesota more but, some of the cover crops are sacrificial. Oats planted after harvest will Winterkill. But the good it does, adding root mass to the soil for instance, is hopefully more than the cost of planting it. Keep in mind, cover crops in theory may not work out so well in practice. The reason they install expensive drainage systems in many Minnesota fields is they already have a problem with too much water damaging crops, potentially causing lower yields. Moving water is easy until you get too much. I’d rather have too much than not enough. We can restore marshlands. Refill aquifers. North Dakota makes out well too. Seems to me to open up some options. Too much and not enough are about the same: lower yields. Link dead – please revive! We thus conclude that ice volume is clearly the more important control on the sequence of warming events. This is consistent with the find-ings in Mitsui and Crucifix (2017), where Bayesian model selection criteria show that global ice volume is a more im-portant forcing than insolation in stochastic dynamical sys-tems as models for Greenland ice core records. Ice volume and weight controls ice advance and retreat. Ice extent is a result of ice advance and retreat and ice extent does control temperature. Ice core data can be used to understand all of this much better. I wonder sometimes if the warm realize how much this hurts their cause. What else can’t be said publicly? That ECS is below 3? Why not use the word “hoax” to describe a public position that experts privately know is untrue? They became political partisans and the party they hitched their wagons to has been proudly, militantly anti-nuke since the 1960s. Admitting that was all a mistake is the equivalent of confessing their chosen party essentially caused AGW by locking in a half century of burning coal. For no good reason. And not only that, they were happily using their perch as experts on climate to boost wind and solar as THE solution ever since the world actually took notice of climate change. From Rio in ’92 to Paris they’ve been advocating for policies they know no intelligent government will ever seriously pursue. Because they know it’s a bad idea. And they tell us this is “urgent”! Does man-made CO2 cause measurable climate change? Of course not, it is only one molecule per ten thousand in the atmosphere, but you can’t say that publicly. Wrong analogy. Both nukes and solar are emissions-free. Better one: if we have electric cars, do we really need to make everyone ride bicycles to work? Of course not, but you can’t say that publicly. “Both nukes and solar are emissions-free”. No, not even close. It is not even true that both are CO2 emission free. You still have to make the stuff! People seem to forget this. How much concrete is used in a nuclear plant? Granted, the plant has a long lifetime and the amount of CO2 emission gets divided by that, but it is not CO2 emission free. Same with solar, only worse. To get above 15% solar and wind, a utility that I am intimately familiar with is building more fossil fuel capacity to peak and keep the grid stable. See Schellenberger’s article. Somewhat depends on many times the construction company blows the job and it has to demolish years of work and rebuild over more years. See Comanche Peak. Run the numbers on how many solar panels and windmills you have to install to power New York City. And remember they’re all steel structures on concrete bases (except for rooftop, where it’s steel and/or aluminum). Then you have miles and miles of copper cable connecting hundreds of square miles of windmills to NYC. Then you have the fossil fuel backup, the diesel maintenance boats working on the offshore windmills, the diesel and gas trucks maintaining the ridgeline windmills and all the power lines. I would make a bet that the emissions from just producing the tons of copper, steel, aluminum and concrete needed for renewables to power a large city (mind you, I’m only talking about producing the raw materials, not actually installing them) would easily exceed all emissions in the construction of a nuke from raw materials to the gas the dude uses to drive over the final permit on opening day. Lousy wind and solar needs natural gas to back it up. Bet on the future of batteries and pumped hydro storage getting built. It locks in fossil fuels while nuclear power can deliver steady while wind and solar cannot. For big energy, What’s not to like? An unstable grid needs natural gas to calm it down. Yes. And what is likely a temporary low NG price is causing us to use more NG (and maybe renewables?) than we probably should. We should be moderating of NG use and conserve it for this purpose. We should not be using it for base load production because its price will not likely remain low and stable, especially if warming doesn’t accelerate or we see cooling or more harsh winters. 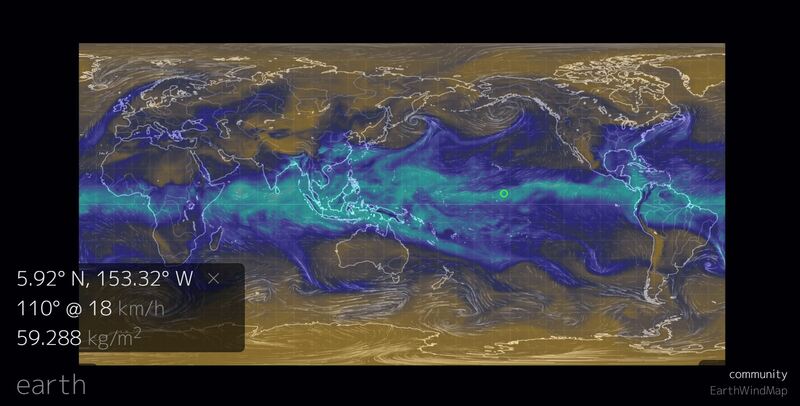 We should be developing are large and variable supply of NG, generally operating on the low end of capacity which can be ramped up for deep and prolonged arctic blasts and other emergencies.. The change in energy content of the planet is approximately equal to solar energy in less net energy out. So ocean heat – measured by Argo – should co-vary with the cumulative sum of radiative imbalances at top of atmosphere – measured in CERES. It does of course with an impressive 0.8 correlation. But does the positive trend in cumulative radiant imbalances – Earth warming – mean much in the context of variability at the turbulent to glacial scales of Earth’s resonant mechanisms? People like to talk about the heat energy stored in the oceans. They totally ignore the energy stored in ice. The ice on land on earth is there because IR energy left earth in warm times, forming the ice. The storage of ice in the warmest times when IR out is the most is used to cause the coldest times when IR out is not enough to cause the cold periods. Cold periods are cold because the stored iced increased ice extent, ice shelf extent, sea ice extent, and reflecting and thawing caused cooling. While I am sure someone can find something to tear down Shellenberger, the highlighted article shows the kind of the communication we need to do. Zeke say negative emission not good enough to get to 1.5C end of century. I think it’s a bad idea to try. Negative emissions is probably a very bad idea. Most agriculture is subsistence. Probably dependent on rising emissions, increased rain, and increased water efficiency in meeting demands of growing population. It certainly is a bad idea to try to reduce global warming. Warming is beneficial. Trying to reduce it costs a fortune, ant this cost t is in addition to the forgone benefits of warming. How does this relate to AGW? They’ve tried to marginalize him. Their tricks have yet to work on him, and have increased his influence. I get the impression he blends science, his area, into his message. I think Hockey Schtick poorly sources his claims above. Yes it’s warm under that ice. The link doesn’t work. Who is the author? Volcanic heat under ice sheets. Surely the dominant consideration is not so much the fact that there are heat sources under the ice, but more so whether the flow of heat has changed over times relevant to the last 2 centuries that host much of the debate on the global warming hypothesis. In geologic time frames, a couple of hundred years is gone in a wink, except for some events such as volcanic eruptions that can pass in a week. That is the question. And it seems that there is nobody to tell that it has changed. Yet we argue with each other. Many lukewarmers and skeptics are pro-nuclear. An approach is for both sides to work on the nuclear power issue. For policy, if all the money spent on wind turbines and solar had been spent on nuclear, we’d have something by now. The Republicans can be said to be lukewarm on nuclear power and partly captured by big oil et cetera. But when I see the unexplained shutterings of our nuclear plants and the off the rails anti-nuke behavior of most of Europe I ask, is this equally the fault of the conservatives? However, is this question just dog whistling another pointless fight? The Republicans can offer unmitigated support for nuclear power. And if Tobias is right, maybe the climate scientists will join them on that issue. How fun would that be? James Hansen voting for Donald Trump. I’m generally Pro tech everything and that includes nuclear power. The most dangerous thing about anything involving nuclear power/weapons is human error, or worse, deliberate human malfeasance. We are our own worst enemies. The logical solution is make them small, modular and as fail-safe as possible. In the case of this GE design I think it’s a step in the right direction. I hope the final design uses a closed loop water/temperature system. Republicans might be “lukewarm” on nuclear, but Democrats have outright opposed it since the 1970s to appease the environmentalists. The only reason we don’t have consensus on nuclear is because it would mean Democrats have to explain why they’ve been wrong for 50 years and are giving up a cherished position and because Republicans would happily vote for nukes- taking away the argument that the GOP is “preventing action” on climate change. For icing on the cake, you don’t need a carbon tax to get nukes. How many Democrats are going to sign on to a climate plan that isn’t a tax increase? Two, three? It’s poetic. We will go crazy with this and lose elections. And it’s the Republicans fault. Yeah they totally screwed up the whole renewable energy thing. Fear sells. They should have used the NRA model and pitched it as ‘freedom power’. Most all preppers and survivalist have solar systems. No one is interested in what you do with your own dollar – just what you want to do with theirs. The American Dream. Be smart and work hard and then be inclusively excluded. That since where we are inclusive to the point of having bells on, we are going to have to exclude you. The easy one is when they demonize skeptics and lukewarmers by giving them whole pages saying what’s wrong with each of them they identify. It’s a playbook for their tribe that I see used in youtube comments. WUWT does the same thing in articles and comments. Mann. Gore. Nye. Assume the reckoning is an exaggeration. I’ve seen climate scientists 1000 times math smarter than I, showing despondency over our fate. Nowhere near a majority though. As we have only nuclear as a viable option and somebody 86ed that deal a few decades ago, they are not optimistic. How many studies about which butterflies are getting toasted as we speak? There’s a big pile of ice, it’s melting. SLR isn’t just SLR, it has put on a jet pack and roller skates. There are heatwaves and hurricanes and lots of rain and droughts and lots of fires. If it bleeds it leads, and that’s our science because thriving is boring. We have to adapt to their frailties. Or they have to adapt to the world. My message to the world is you have adapt to me, or I will cry, or sue you or flame you. Maher maybe got this one right instead of being a libertarian in name only. How many things can they put a torch to? Campus comedians no more. It is simply a lecture to his students, pre-hystery I suppose. He’s a professor at a liberal college teaching us about us. He talks about Harry Potter and how it used a recurring theme. He talked about our history, the things we’re supposed to know and how the young blend that with new things which we can call progress. CFACT has published my first comment to EPA on their proposed scientific transparency regulation. Unlike most commenters I am trying to figure out how to make this proposal actually work, which is not easy. The concept of transparency is far from being well defined and mandating vagueness is a bad plan. When a king like organization grows up… …any organization that’s a hierarchy and powerful, there’s a shadow element of it that tends towards totalitarianism and tyranny. Intelligence produces models of the world and falls in love with the models. And that makes them totalitarian. There doesn’t need to be anything else… …If you rebel against the system, you are regarded as the enemy of truth. Hayward says it better at the WSJ but that’s paywalled for me. “STAGE ONE: The first stage involves groups of experts and activists calling attention to a public problem, which leads quickly to the second stage, wherein the alarmed media and political class discover the issue. STAGE TWO: The second stage typically includes a large amount of euphoric enthusiasm—you might call it the “dopamine” stage—as activists conceive the issue in terms of global peril and salvation. This tendency explains the fanaticism with which divinity-school dropouts Al Gore and Jerry Brown have warned of climate change. Part of Down’s 5 stages applying to a number of problems. And why it rings to me is the cost of these things. Lomborg was right. One of the arguments I see is, It’s cheap. This stuff is so cheap. The costs are down. These things are people selling you something. Examples of the final state. The war on poverty and drugs. Assume a battle from the right above. Attack each successive stage until you don’t have to anymore. As the money spent piles up and the results are lame the vigor of the movement wains. Those stages apply to lead in drinking water too. First the denial, then the resistance because it is too expensive to fix, or maybe it doesn’t affect people who matter to the politicians. Take any other pollution issue and it is the same pattern. That sounds expensive. But politicians don’t set drinking water standards. Politicians can carry out risky policies to save money, and ignore or suppress inconvenient danger signs. There is an elephant in the room Jimmy – that hand waving won’t dispatch. Just try to ignore aye? Once you cross the line, you can get a large audience, like Jordan Peterson did. This line can be something few stand up to. This one is an interview of Jordan Peterson. The host who did a fine job kept coming at him from the left. I was laughing. It reminded me of all the people coming at him and saying negative things. He handled it well. And I think scored a lot of points. The host kept bringing up other issues more important than SJWs. Peterson had written papers about many of them. The above is also good for his mention of chaos. Found in the Bible, Buddhism I think, and the Dao. Three elements, Order, Chaos and the line between the two. He is speaking of society, but we learned everything we know from nature. He suggests the path is the line between the two. Now place the reductionists on one of the elements. They want order in common with the social right. Their ordered climate is drifting into chaos. They argue, this is chaos, extreme weather. Record temperatures are chaos. SLR too. We are to be scared as children reading the Bible, of chaos. If we realize we aren’t going back, moving to the line is maybe not a bad idea. Chaos is coming and they want to stop it.